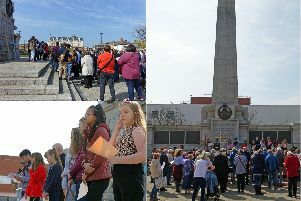 Youngsters and their families have been enjoying a nautical extravaganza at a special event to mark the National Museum of the Royal Navy taking over Hartlepool’s Maritime Experience. A volley of musket fire signalled the opening of Welcome Aboard!, with CBeebies TV presenter Andy Day and Nicola Wood of CBBC’s Deadly Art topping the bill. Crowds watch Cbeebies presenter Andy Day at the Welcome Aboard! event in Hartlepool. Among the highlights were historical re-enactments by Georgian naval crews, HMS Royal Marines and the Press Gang, while storytelling sessions also took place and there was the chance to get involved in maritime arts and crafts in the Museum of Hartlepool. The programme of events is set to culminate in a dazzling daytime firework display which lit up the coast off Hartlepool. Among those enjoying the fun have been Suzie Moore, her husband and Hartlepool councillor Shane, and their children Henry, eight, and Emily, one. "We came down because my son really wants to see Andy," said Suzie, 35. Members of the Historical Maritime Society at the Welcome Aboard event at Hartlepool Maritime Experience. "As soon as we knew this was happening we wanted to visit and it's good that the weather has stayed nice. "There are a lot of people here." Katie Stephenson brought her four-year-old son Ruben Stephenson, who was dressed as a pirate, to have a look around the attraction. "We live in Hull but my husband works in Hartlepool and knew this was on so we wanted to come up for the weekend," said Katie, 38. "It's absolutely fantastic what's going on and it isn't often you get to see things like this which are free nowadays. "It's a great thing for the town to have." Once completed, the new museum will tell the story of the Royal Navy surface fleet, the Fleet Air Arm, the Royal Marines and the Submarine Service and will include exhibits such as aircraft and guns. The NMRN has now taken over the running of the attraction from Hartlepool Council and over the coming years is set to invest heavily in the site, creating a museum which will feature a host of items from its collection and attract an estimated 140,000 extra visitors to the town each year. Council leader Councillor Christopher Akers-Belcher and director general of the NMRN Professor Dominic Tweddle signed a historic agreement to cement the partnership. "It's been an exciting day for the town," said Coun Akers-Belcher. "We've had a great turnout from all over the North East. "This agreement means a lot of investment which will safeguard the future of the site for the next couple of decades and hopefully it will provide a boost to the town's economy." Prof Tweddle said: "There's a huge sense of relief when we got the agreement over the line, but that's now in the past. "This is a popular site already but not as popular as it deserves to be. "With all of the assets it has, we have great ambitions to almost double the number of visitors and we're hopeful that we can do that." Chris Jones, of the Historical Maritime Society who have brought many members to the event, said: "We come here often and hope that things will get even better thanks to the navy museum getting involved. "People from a lot of different areas have been visiting today and it's no surprise because it's got some amazing things like the Trincomalee, which is the oldest warship floating at the moment."